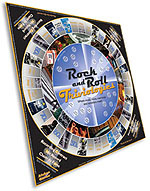 Buy your very own ROCK AND ROLL TRIVIOLOGIES Board Game! Build your own band with the COMPLETE Rock and Pop music trivia game! This game features in-depth and interesting music trivia from all of the great Rock and Pop artists starting with their roots in the 1950s to the present. Explore different music trivia categories including women rockers, record collections, rock and roll relationships, music venues and more — then earn “industry awards” to win the game. Perfect for adults and Baby Boomers who enjoy MUSIC and board games.